Low uric acid (LUA) Dalmatians go AKC! Simple genetics but complex history, from first cross-breeding to the DCA vote and success! Today the AKC accepted Low Uric Acid (LUA) Dalmatians into the registry after Dalmatian owners finally persuaded the Dalmatian Club Of America membership. The AKC Board reviewed the results of a vote by the membership of the Dalmatian Club of America (DCA). By a 55-45% margin, the membership voted in favor of registering these dogs. Following a motion by Dr. Newman, seconded by Dr. Smith it was VOTED (unanimously) to authorize AKC Staff to develop procedures for the registration of these dogs. The procedures will be developed in consultation with the Board of the DCA. To ensure that the introduction of the Low Uric Acid dogs into the registry is an informed, voluntary decision, the registration numbers for the Low Uric Acid Dalmatians and their descendents will have a letter indicator as part of the registration number. The Dalmatian Backcross Project commenced in 1973 with the original outcross of an AKC registered Champion Pointer sire CH Shandown's Rapid Transit bred to an AKC registered Dalmatian dam Lady Godiva. Dr. Robert Schaible conducted the breeding in an effort to address the Dalmatian fixed genetic defect that affects uric acid metabolism and that may lead to increased urinary uric acid, urate crystals, urinary bladder aggregate formation, stones, urinary tract obstruction and even death. 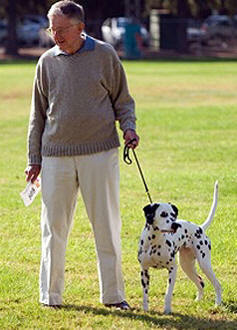 AKC registered Dalmatians were used in subsequent matings of the progeny of the original Dalmatian-Pointer cross. The first three matings, termed “backcrosses”, yielded progeny generally distributed as Low Uric Acid (LUA) and High Uric Acid (HUA). Urinalysis was used to distinguish LUAs from HUAs in litters. In 1981 Dr Schaible requested registration for two of his dogs with the American Kennel Club. After careful evaluation the AKC granted registration of Stocklore Stipples and Stocklore Linus . The president of AKC stated “If there is a logical, scientific way to correct genetic health problems associated with certain breed traits and still preserve the integrity of the breed standard, it is incumbent upon the American Kennel Club to lead the way” Stipples went on to win several points at AKC shows. News of registration of Dr. Schaible’s Dalmatians, cause a great deal of controversy. In 1984 a majority of Dalmatian Club of America members voted that they were opposed to registration of descendants of the Dalmatian-Pointer backcross. In response to that vote, the AKC put a hold on registration of any more Dalmatians from the line created by Dr. Schaible. DCA considered the matter closed and the subject was off limits at meetings and in the club magazine for the next 22 years. In 2005 Denise Powell a well known breeder obtained a female LUA puppy from Dr Schaible and the LUA project which was in danger of extinction was revived. In that same year, DCA sponsored a study in which ultrasound was used to detect bladder stones in Dalmatians. 377 Dalmatians took part and it was found that 25.4% of the females and 71.3% of the males had sludge crystals and stones in their bladders. 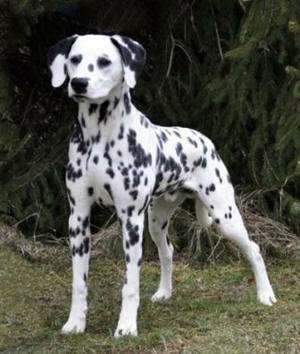 In 2006 the membership of DCA was polled as to whether the members favored the continuation of testing and the breeding of LUA Dalmatians. This passed with a resounding yes. However the question of registration was not raised. In 2007 Danika Bannasch DVM PhD announced that the gene that controls uric acid had been identified and a DNA test for normal or the mutated gene had been created. In 2008 a group of LUA Dalmatians were invited to attend the Nationals so that the membership could see for themselves that LUA’s were no different from their AKC cousins. The people who met the LUA Dalmatians in person were asked to complete a confidential questionnaire. The response was overwhelmingly positive. Proponents of LUA Dalmatians felt the time was right to begin discussing how LUA Dalmatians could finally be integrated in to the general population of Dalmatians - in other words what steps would be necessary for LUA Dalmatians to be registered with the AKC. Unfortunately, opponents of LUA Dalmatians were able to convince a slim majority of DCA members to vote against any discussion of registration. Since the Dalmatian Club Of America was not willing to discuss registration and gave no indication of when the topic might be opened for discussion in the future, proponents of LUA Dalmatians decided to approach the AKC directly. In the spring of 2009, a petition asking the AKC to register descendants of the backcross project was circulated among Dalmatian fanciers and veterinarians. In 6 weeks time over 1,000 signatures were gathered and sent to the AKC. In June 2011 ballots were sent to all DCA members asking if they were in favor of registration for descendants of the Pointer-Dalmatian backcross. 55% voted Yes. At the July meeting the AKC board voted to allow registration of descendants of Stocklore Stipples. One further note; the Kennel Club of the United Kingdom had already recorded that three imported LUA Dalmatians are indeed real Dalmatians and are registered with the Kennel Club. This year Fiona who had been imported by Julie Evans of the UK won enough shows to be asked to attend Crufts. A fourth LUA female resides in France. In closing I would like to say that Dr. Schaible’s dedication to Dalmatian health which lead him to persist for over 40 years, against all odds, is an inspiration to all who envision a better future for all purebred dogs.